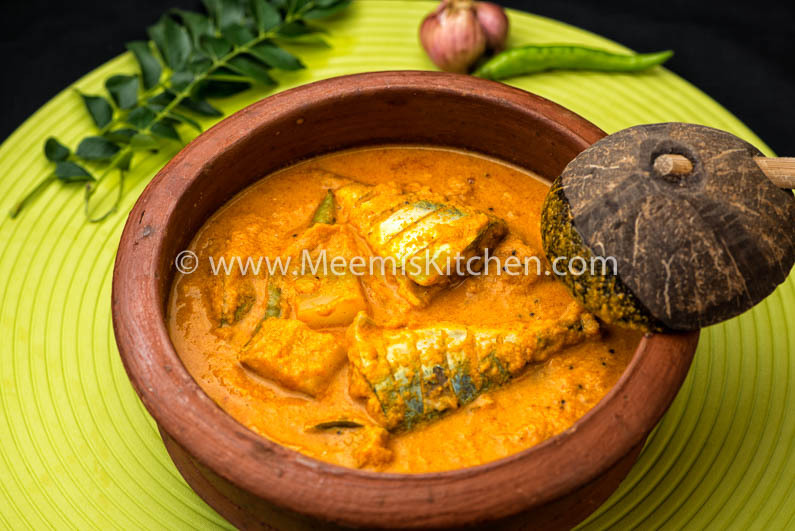 Ayala Curry (Mackerel) with Mangoes or Kerala Ayala curry is an extremely delicious dish prepared in a spicy Coconut Paste, popular in Kerala. Yes, the mangoes takes it to another level adding to the tanginess and taste. It just tastes so good, that you will get hooked to it. Kerala has no dearth of seafood recipes. 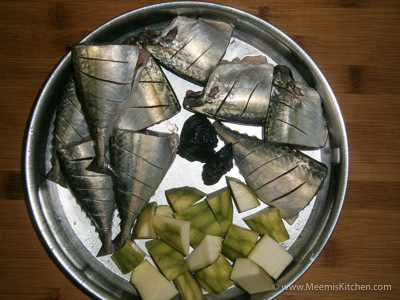 Each region boasts of different varieties of fish curry; some are prepared with special Fish Tamarind/ Kudampuli, fish with Coconut milk, another with Valanpuli and coconut milk, Fish peera pattichathu and yet another with Vinegar, there are many popular recipes and this Ayala Curry (Mackerel) with Mangoes is one of them. Mackerel or Ayala as you know is a great source of Omega -3 and other vitamins, a tasty and healthy fish to add to your diet. Although this fish curry with Mangoes can be prepared using any fish, I prefer Ayala, as it brings back many nostalgic memories. It is hard to forget the taste of yester years, especially when your mom’s magic hands whip up those enduring, delicious golden memories! Ayala Curry should be preferably cooked in earthen Pots/ clay pots, the traditional way, as it enhances the taste and flavor. This is a classic fish curry or seasonal fish curry that depends on Mango season like Kaduku Manga pickle, Mango smoothie, Mango chutney, Mango chemmeen Thoran! Mangoes adds a distinct flavor to the dish and sure makes your mouth salivate! 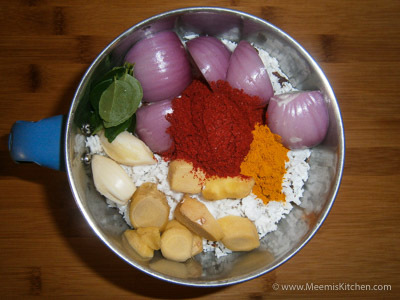 In Kerala, several variations of this recipe can be found, depending on region or unique style at each home. This is a well tried and tested recipe with the lingering flavors of Mangoes, (I love the mangoes more than the fish and the thick spicy coconut gravy!) a great combination with steaming rice! 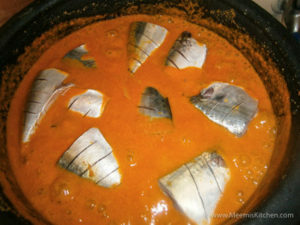 Here is the lip smacking recipe of Ayala Curry (Mackerel) with Mangoes! Unripe/ Raw Mango : 1 no. Kudampuli/ Fish Tamarind : 1- 2 nos. Small Onion/ Shallots : 6-8 nos. Clean and pat dry the fish. Make small slits on the both sides. Keep aside. Peel the mangoes; make sure you peel nice and thin. Cut the mangoes into small cubes and keep aside. 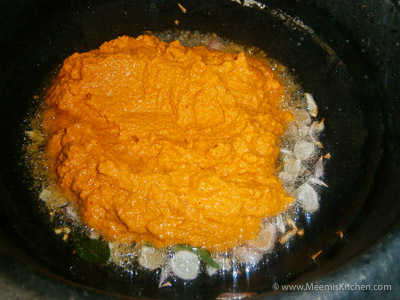 Make the coconut paste by grinding 1 cup Coconut with Onion, Ginger, Garlic, Curry leaves, Chili Powder and turmeric. Add little water and grind into a smooth paste in a blender. 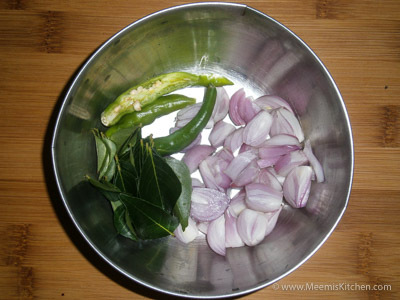 Slice the shallots and slit green chilies. Heat coconut oil in a Clay pot/ earthen ware or Kadai and pop mustards and Uluva. Add the sliced shallots/ small onion, curry leaves and green chili and fry for few minutes. 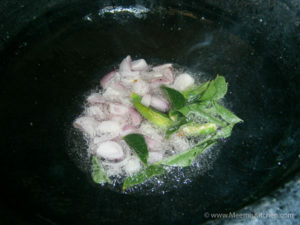 Now, add the Coconut paste and fry for few minutes, stirring constantly. Mix 1 ½ cup water and adjust salt. Bring to a boil and add Mango pieces and Tamarind. 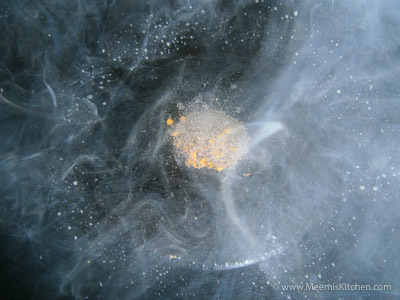 Simmer the heat and let it cook for few minutes, stirring occasionally. Lastly, add the fish pieces and swirl the pot to combine well. Adjust the salt and cover and cook for 5-8 minutes. Swirl the pot in between to combine well. Enjoy with steaming rice and any vegetable thoran/ side dish. Any fish can be used for this recipe, but Ayala/ Mackerel gives a distinctive taste. 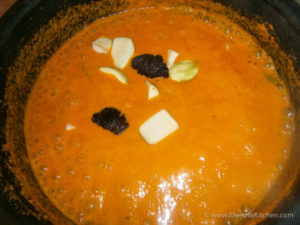 Green, unripe Mangoes which are medium sour is best suited for this Ayala curry. If the Mangoes are too sour, you will not enjoy the sour bites. Coconut paste should be finely ground, to make a smooth paste. I don’t use Coriander Powder. 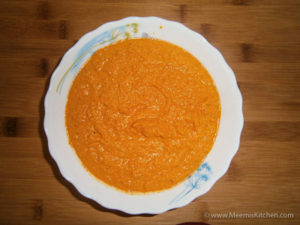 Use Kashmiri Chili powder to get that fresh, deep Orange color to the dish. Ginger is used generously while Garlic is used less for this curry to correct and enhance the flavors. Kudampuli/ Malabar Tamarind is used sparingly just to adjust the tanginess of the gravy. Some people use Tomatoes instead of tamarind.